Weighty Matters: The ADA bravely tackles acute American male beer drinking deficiency syndrome! The ADA bravely tackles acute American male beer drinking deficiency syndrome! Yup, the American Dietetic Association wants me to drink, to "Have a Brewski, Help my Health!". Of course so does the Harvard School of Public Health, but unlike the ADA, they don't try to appeal to my inner College student to sell me on it. Harvard's take on alcohol is a sober (pun intended) reflection on the heart benefits of alcohol vs. the real risks of problem drinking. "the perfect way to relax at the end of the day"
Really ADA? 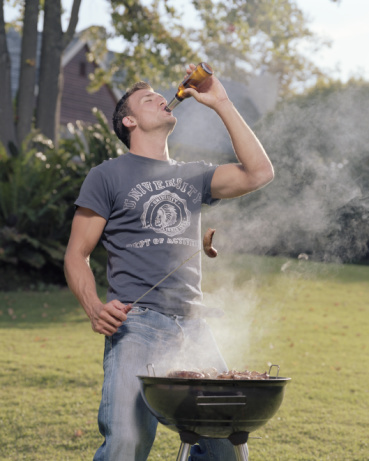 Of all the healthy foods and beverages out there, the one you think should headline your new Men's Health page is beer? That's the super-food American men aren't getting enough of? "Grill Your Way to a Six Pack"
"Want to Get Lean? Eat Fat!" Pretty soon all American men will look exactly like the guy in the photo up above - grilling our way to six packs, eating sausages and drinking kidney happy, bone strengthening, B-vitamin and fiber filled beer every night to relax! Now I enjoy a BBQ and a cold beer as much (or more) than the next guy, but ADA, did you really think that just because you've got the words "men's health" on your new men's health page, that you had to come at men with the same sort of brilliance as Men's Health (the magazine)? No higher standards here.